If the wavelengths ends in .5 (such as 1.5 λ, 2.5 λ, 3.5 λ...etc) the type of interference is destructive (quiet). You are solving for v.
Use the frequency that you just found. You are now solving for the wavelength. 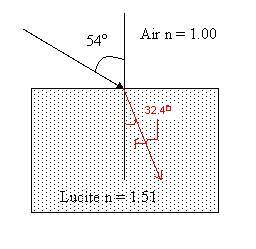 32.4 degrees is the refractive angle in the Lucite. Now cross multiply and divide! Take the inverse of sin. ****The angle in the faster medium (in this case, θ2) is always 90 when solving for a critical angle.